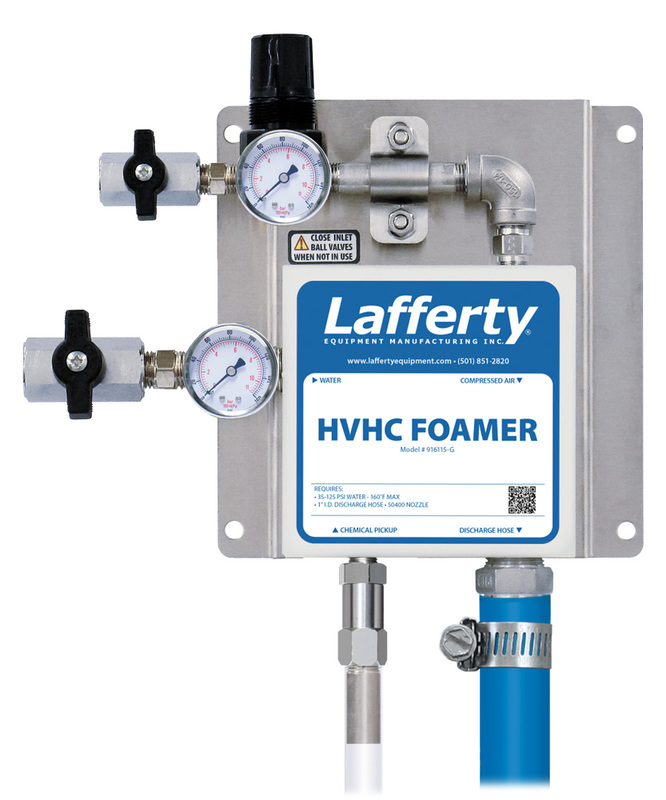 HVHC Foamer W/ Gauges | Lafferty Equipment Manufacturing, Inc. The HVHC Foamer With Gauges is a high volume, "high concentrate" foam applicator that will produce strong dilution ratios for the toughest cleaning jobs. Weaker dilution ratios are achieved with metering tips. This venturi injection system uses standard city water pressure (35 - 125 PSI) to draw and blend a high concentration of chemical concentrate into the water stream to create a very strong chemical solution. A high volume of rich, clinging foam is created by injecting compressed air into the solution to greatly increase volume and coverage ability. The foam is then projected through the discharge hose and fan nozzle at distances up to 15 feet (25 feet with zero degree nozzle). Gauges display incoming water and air pressure.